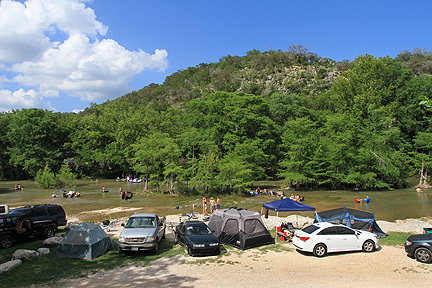 Whenever a Texan uses a phrase like “we’re going to float the river” or “let’s go tubing,” there is little doubt that they are bound for the beautiful Guadalupe River in the heart of the Texas Hill Country. Fed from two separate springs in Kerr County and stretching nearly 400 miles into the Gulf of Mexico, the historically rich Guadalupe is truly a Texas jewel, offering everything from calm, meandering runs to exciting whitewater rapids and even waterfalls. Its limestone banks are lined with bald cypress, sycamore, and pecan trees, some of which rise more than 60 feet over the water. Artifacts discovered in the Guadalupe watershed suggest that the river has supported human life for several thousand years. In the last half century, however, it has become the premiere Texas destination for tubing, rafting, kayaking, fishing, and camping, attracting well over a million visitors every year. 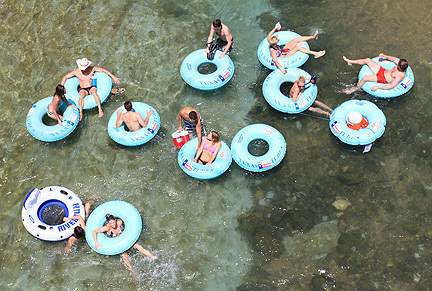 Though the variety of recreational adventures is plenty on the Guadalupe, tubing is the undisputed king. In the spring and summer months, people from all over the world come to enjoy the river’s Class III rapids and natural beauty from the comfort of an industrial truck inner tube. Some like to lay back and relax with a drink in hand, sometimes hooking their feet into friends’ tubes to create a veritable party caravan, complete with a radio and ice chest. Others like to swim around the river, hitching rides from tube to tube. Some thrill seekers may attempt to actually stand on the tube, challenging friends to see who will fall off first. Numerous access points along the river allow tubers to spend day after day frolicking in the warm river waters, sometimes opting for “long floats” which can last for the better part of a day, and other times going for “short floats” which can be completed in less than an hour. When the water level and flow rate is just right, there can be literally thousands of people manning tubes, kayaks, canoes, rafts, and fishing poles along many different sections of the river. The city of New Braunfels is far and away the most popular launching point for these adventures. Founded by German immigrants led by Prince Carl Solms-Braunfels in 1845, New Braunfels sits on the confluence of the Guadalupe River and one of its tributaries, the Comal River. 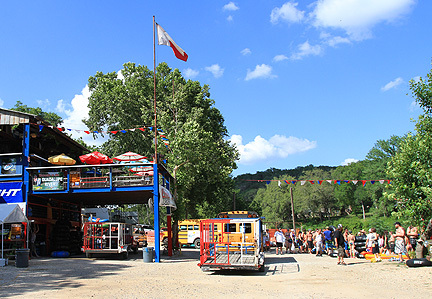 It is the perfect place to base your river vacation, with numerous gear outfitters, campgrounds, cabins, hotels, restaurants, shopping, and night life all located near the celebrated River Road, which parallels the Guadalupe for miles. 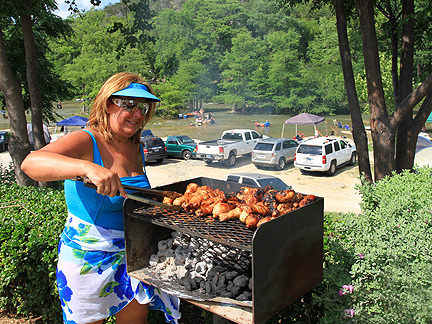 The most affordable way to enjoy the river from New Braunfels is stay at a campground. Places like Lone Star Float House, 2nd Cross Camp, Camp Huaco Springs, Gilligan’s Island, and others offer RV, cabin, and tent camping for as little as $35.00 per night, and their waterfront location along River Road means easy access to the river. Be sure you book reservations well in advance, though, as spring and summer accommodations are in high demand. Those that prefer a little more luxury in their lodgings can choose from a host of conventional hotels, condos, and guest houses on River Road or at least within a few miles of a river access point. Gruene River Inn, Oak Hill River Inn, and Rio Raft and Resort are but a few locations offering coziness and comfort after long days in the sun, and they can accommodate large parties as well. For increased privacy and a little more extravagance, rent a waterfront house complete with security fence, volleyball court, BBQ pits, and a big screen television. During prime months, all the above properties can run between $149.00 - $249.00 per night, and they fill up very fast, so again, make your reservations early! Looking to split the difference between camping and luxury? There are plenty of hotel chains in the New Braunfels city proper offering rates around $100.00 per night, and they are only a short drive away from the river. Check with LaQuinta Inn, Best Western, and Quality Inn for pricing during your intended reservation period. Great, you ask, but where do I get my tubes to float the river? No worries! In New Braunfels, river bound visitors can choose from a plethora of outfitters to rent river gear from, and not just tubes. 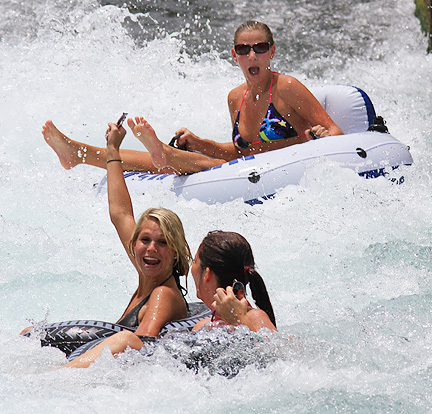 The popular Rockin’ R River Rides rents tubes with bottoms built in as well as river rafts in various sizes. Same goes for the previously mentioned Rio Raft and Resort, which also rents sit-on-top kayaks and tubes with ice chests. And don’t forget about Tube Haus, River Sports Tubes, and Guadalupe Canoe, which are only a few more of the many available options around waterfront. Believe it or not, there is so much more to see and do in the Guadalupe area around New Braunfels. 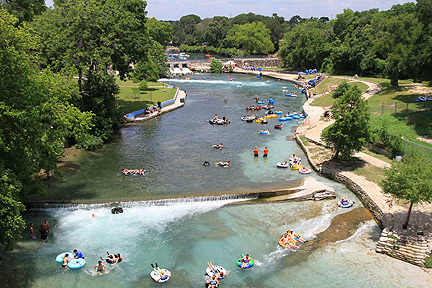 Prince Solms Park, former site of a mill and factory established in 1850 shortly after the arrival of the German settlers, is now the scenic home of the “Tube Chute,” a swift, winding slide that diverts tubers around the city dam as they float the Comal river. The park also hosts a “disc golf” course, which is free for everyone, as well as picnic tables, BBQ grills, hiking trails, tennis courts, and a playground. 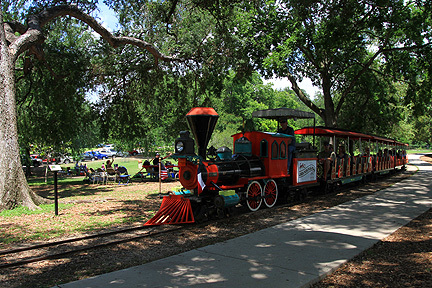 Charming Landa Park offers a miniature train ride around the park’s perimeter, as well paddle boating on the Comal Springs and Landa Lake. Patrons can also take in a round of miniature golf and enjoy an extensive nature trail featuring over 50 species of trees. Those seeking a little more excitement in New Braunfels can check out the Texas Ski Ranch, charter a helicopter ride, and even rent a motorcycle! Brimming with awe-inspiring natural beauty and a rich heritage, the Guadalupe River is a must visit for any Texan or tourist. Aside from great views and easy access to the Comal, families can also have a blast at the world’s #1 ranked waterpark, which sits right on the premises! 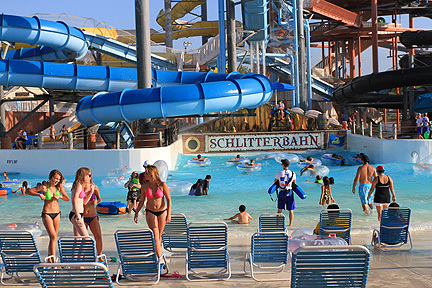 For maximum family fun, check out Schlitterbahn Resorts and Waterpark, situated on the banks of the Comal River. Massive water slides, tube chutes, and boogie boarding are the name of the game at world famous Schlitterbahn. Don't be surprised if you meet generations of families who have been vacationing in the area for decades, renting the same lodgings year after year. Who knows, perhaps your family will follow suit! Come to the river for the tubing, stay for the wealth of fun and experience, and leave with a lifetime of memories. Click here for more information about New Braunfels.